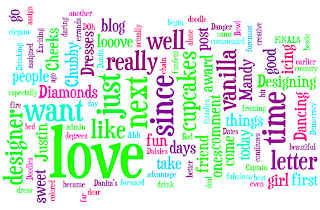 This was my most used blog words (click it to make it bigger!) as of about 20 mins ago. and maybe, just maybe, I say love too much ;) To get one of your own just go to http://www.wordle.net/create and you can enter your blog URL, or even someone else's if you're curious. I played around with the colors & then I just took a screenshot, and then opened it in PS to crop it to just the words! I'm sure you could paste it in Paint too. Just find your PRT SC button ;)! !